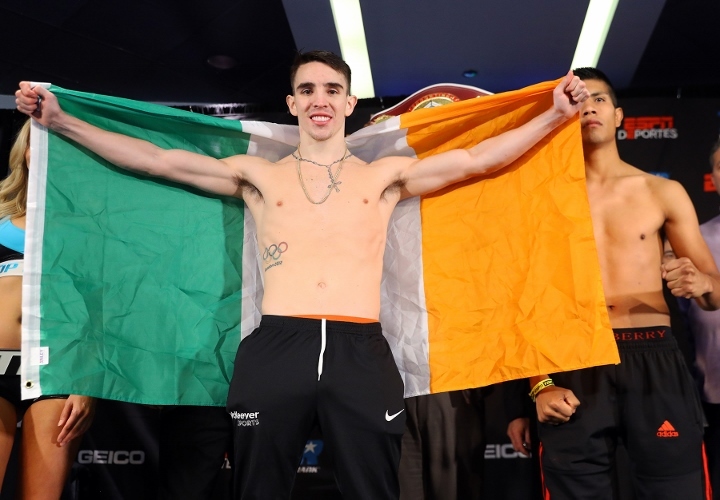 For the third time in as many St. Patrick’s Day holidays, Irish eyes were smiling over a Michael Conlan fight night in New York City. The two-time Olympian and 2012 Bronze medalist from Belfast, Northern Ireland continued his tradition of headlining—and winning—at Madison Square Garden’s Hulu Theatre on Ireland’s most celebrated day. The latest came in a boxing-beautiful unanimous decision win over Ruben Garcia Hernandez in their ESPN headliner Sunday evening. Scores were 100-90 across the board in favor of Conlan, who was in control every step of the way, even if forced to hear the scorecards for the first time on this holiday. Conlan—who enjoyed a celebrated pro debut here exactly two years ago—switched back and forth between southpaw and conventional stances, frustrating Garcia with in and out movement. The distance between the two was relatively close throughout, but almost always beyond the outstretched reach of Gstcia who struggled to get his offense untracked. Conlan banked rounds, a rare occurrence in the MSG basement as his previous St. Patrick’s Day trips here both ended in early knockout victories. In fact, Garcia coming out for the 6th round marked deeper territory than Conlan’s previous two St. Patrick’s Day appearances combined. Fittingly, the round featured a far more dedicated body attack than at any point to the contest. To his credit, Garcia took the shots well, but at the expense of a dramatically decreased punch output. By round eight, Garcia’s corner grew increasingly concerned over the amount of punishment he was absorbing, particularly to the body. Conlan continued to chip away, scoring with right hooks and left hands downstairs out of the southpaw stance, before flipping back to conventional stance and sticking right hands in Garcia’s grill. The lack of a steady jab from Conlan was perhaps the difference in the decision win he earned and a stoppage victory that could’ve come of the night. Garcia’s only loss inside the distance came at the hands of former bantamweight titlist Randy Caballero more than three years ago, whlle extending legendary Nonito Donaire the full ten rounds 18 months ago. Conlan is in good company either way, as he picked apart a foe who doesn’t fold easily. The win advances his record to 11-0 (6KOs), including a perfect 5-0 on Madison Square Garden grounds, having literally never lost a round in this part of town. Plans prior to his pro debut called for Top Rank to develop a rivalry between the Belfast boxer and 2016 Olympic Silver medalist Shakur Stevenson for a superfight down the road. For now, they are on vastly different paths—Newark’s Stevenson blitzing toward contender status—while another amateur rival is being discussed for Conlan in the form of his last conqueror, Russia’s Vladimir Nikitin. The two infamously met in the 2016 Rio Olympics quarterfinals, with Nikitin taking a highly questionable—and believed to be corrupt—decision win to advance to the medal round. The feat left a dejected Conlan to “flip the bird” to the judges and deliver an epic post-fight rant—but also caught the attention of the brass at Top Rank, who have done a masterful job in developing his rising star power. A stroke of genius also came in their signing Nikitin, who fought on Sunday’s undercard and struggled at times in a majority decision win over Juan Tapia. Plans now call for the two to meet in the pro version of the rematch to their 2016 meet, although Conlan might be too far advanced for such a fight especially as Nikitin is still feeling his way as a pro. Whatever the case, the 27-year old prospect is in a much better place in his career than is the case for Garcia, who returns to Mexico City with a ring record of 24-4-2 (10KOs). The veteran gatekeeper came in with a three-fight unbeaten streak, but it’s now back to the drawing board as he absorbed a lot of punishment over the course of 10 one-sided rounds. This Mick is gonna get destroyed once he steps up.